DEAL failed to turn up to a hearing today, possibly in Norwich. b) filing the discontinuance with the defendant in the 11th hour. The defendant was awarded costs of £190. This looks like the latest sneaky tactic of Gary Warne and Ashley Cohen, who are apparently the controlling minds behind DEAL. By filing the discontinuance with the defendant, they hope that the defendant does not turn up at court. Faced with a no-show on both sides, the judge may well just strike the case out, or best case, rule for DEAL on the paperwork. This time they came unstuck with a judge who knew the rules on allowing costs for unreasonable behaviour. The Prankster has so far never heard of a case where DEAL have turned up. Were you 'the one'? If so, contact the Prankster. If not, don't forget to inform the government survey about this sharp practice and mention that DEAL and Civil Enforcement Limited appear to be the same company and the controlling minds appear to be Gary Warne and Ashley Cohen. This newspaper report details how ParkingEye issued a ticket to a man who had sold his car six months previously. Colin Leggett, the former owner, contact ParkingEye by email to inform them of the details of the new owner, but ParkingEye refused to cancel the charge. When asked to comment by the newspaper, ParkingEye stated (obviously unaware of the irony) "ParkingEye operates an industry-leading audited appeals process." 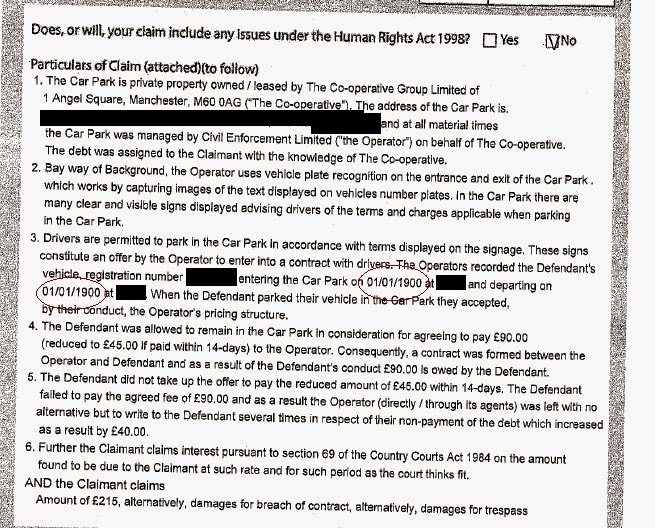 The legal situation is that this parking charge is covered by contract law, which in normal circumstances would mean only the parties to the contract are liable- in other words the driver. Recent changes to the law, mean that since 1 October 2012 the keeper, in certain circumstances, can also be held liable. Mr Leggett is certainly not the keeper. The new owner might be. ParkingEye therefore have no possible prospect of enforcing any charge against Mr Leggett. ParkingEye head of legal is Rachel Ledson, who seems blissfully unaware of the laws under which her industry operates. Ms Ledson has a history of filing cases against motorists who are neither the driver nor keeper as this blog post from 2013 confirms. 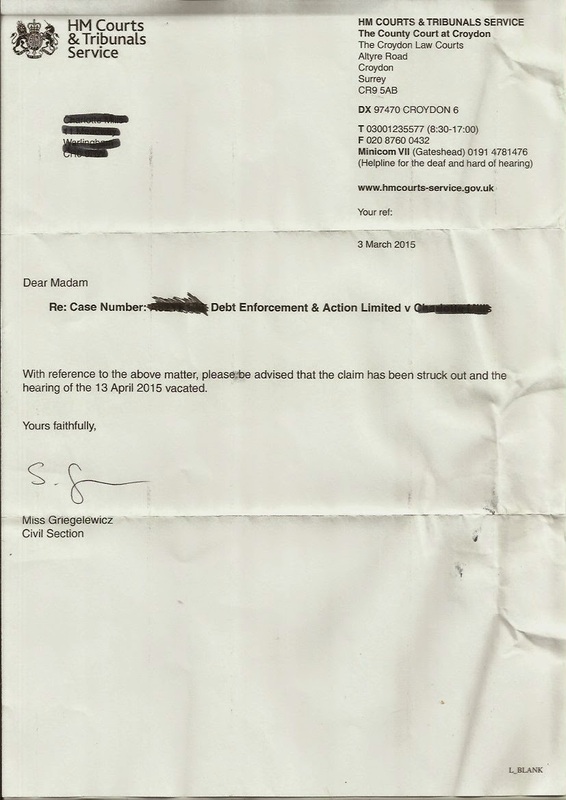 ParkingEye's other solicitor, and the one who now files court claims, is Rosanna Breaks. She has not previously been known to be involved with filing claims when the defendant was neither driver nor keeper. The Prankster will therefore be keeping an eye on this charge to see if Ms Breaks breaks her duck. Where an operator with a registered office in the parish of Euxton in the County of Lancashire has served what passes for a notice to keeper roughly in accordance with paras 8 or 9 and that in purported satisfaction of that notice a keeper has disclosed the name and a serviceable address for the driver (or keeper) then if the said operator doesn't like the response they can stamp their feet and act like complete numpties and demand that the respondent does what they say rather than simply comply with this schedule. Many thanks to HO87 for pointing this out. The coffin carrying the remains of King Richard III entered Leicester Cathedral yesterday ahead of his burial on Thursday. A spokesman for ParkingEye said the signage was perfectly clear that if anyone stayed in the car park for longer than the permitted two free hours then they would be buried in a Cathedral well away from their home County. Despite allegations from a minority pressure group – The Plantagenet Alliance, this was not a breach of the BPA COP. 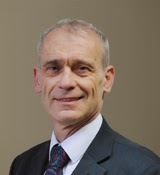 Mr. Morley, CEO of the DVLA, said that it had been quite appropriate for it to have provided data regarding Richard Plantagenet to ParkingEye as it had, in accordance with paragraph 7(4) of Schedule 4 of the Protection of Freedoms Act, placed a notice on Mr. Plantagenet whilst he was stationary and before he was removed from the car park. This also satisfied the requirements of paragraph 20.6 of the BPA COP. The DVLA spokesman understands that Mr. Plantagenet did not lodge any appeal to ParkingEye or POPLA. I am content that there has been no breach of the code in relation to the service of the notices on Mr Plantagenet. Parking Eye has submitted the following text, and are happy for me to forward onwards. ParkingEye has been fully compliant with the BPA COP and served all of the correct notices. Within the UK, the occupier of any land or building will need title to that land or building (i.e. "ownership"), to apply for a burial in a Cathedral of anyone remaining in that car park for longer than is permitted. As ParkingEye do not take an interest in the land, it was not possible for us to make such applications in our own right. I am content to close this case off. The Prankster site passed 1,000,000 all time page hits this week. The Prankster does not know who the 1,000,000th visitor was but it may be regular viewer SR-S, whoever that is, who apparently often visits for hints and tips. Many thanks to all viewers for their interest. 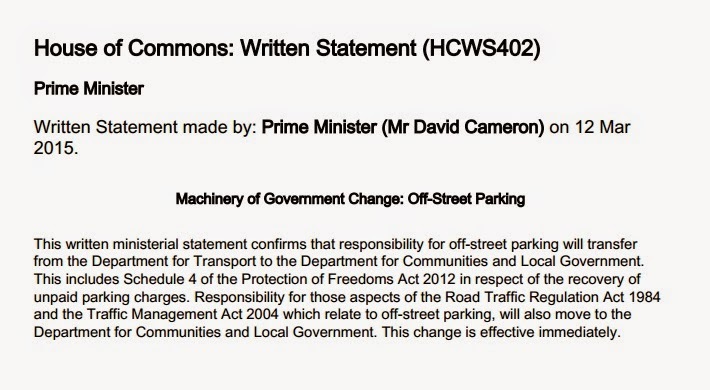 The Government has issued a press release announcing it will clamp down on private parking charges. The open consultation document is here and closes 25th May 2015. Please take this opportunity to influence Government policy. The Prankster has a vast collection of evidence of bad practice, which he will be submitting. This list is not exhaustive, even if it is exhausting. 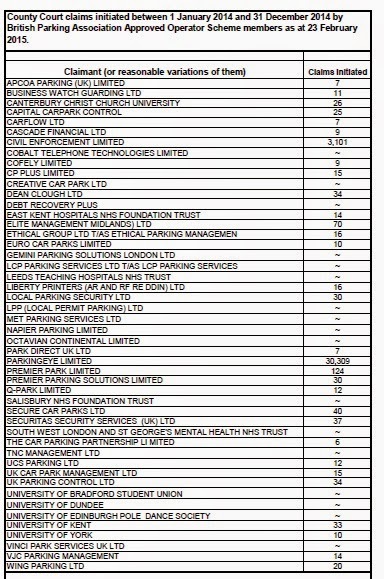 If you have suffered any of these dodgy practices, from ParkingEye or any other parking company, please be sure and contact the High Streets Team. 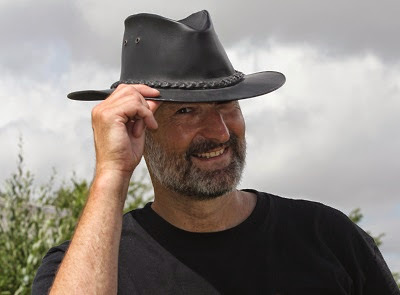 The Prankster will also be informing the Government of the circumstances surrounding the hoax phone call which caused the ParkingEye v Beavis and Wardley hearing to be adjourned, along with the details of all legal persons involved. The next hearing for the case against Civil Enforcement Limited is due in Aberdeen on 31st March. This case was previously blogged here. The Prankster is not likely to be spectating and would welcome any court reports. DEAL fail to turn up, fail to turn up, fail to turn up. 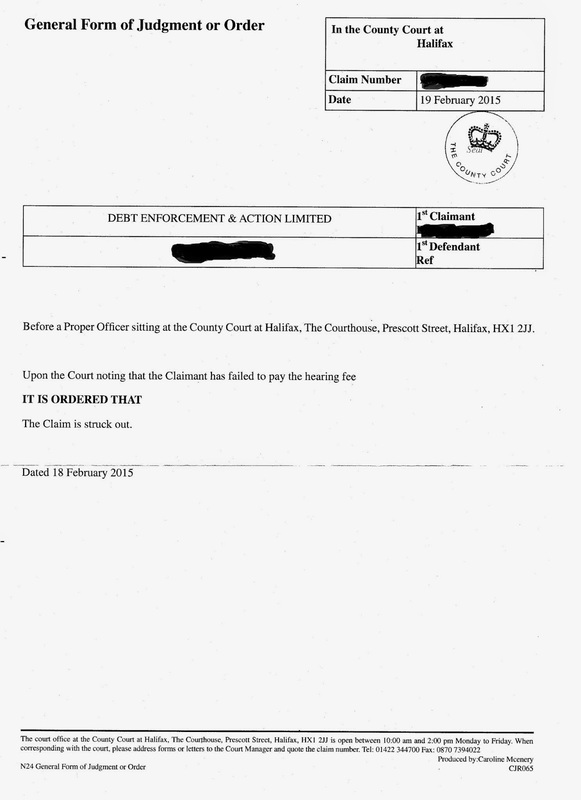 An urgent e-mail was sent to Liverpool County Court 17/3/15 15-50 by leyla@creativecarpark.co.uk saying they wished to discontinue the proceedings Debt Enforcement & Action Limited v Mr McC. Due to the late notification the Judge heard the case and found in the defendant's favour with £71-08 costs to be paid by 1/4/15. Upon reading the court file, DJ Corrigan struck DEAL out at Yeovil. The defendant arrived at Chelmsford court by 9.30 for a hearing due at 10.00. 2 hours were set aside for the They went into the courtroom just after 10. Judge Rodger after exchange of pleasantries asked if they had got the letter? (What letter? No, I haven't had any letter.) He then said that he had just received a letter at 9.50 from DEAL stating that they were discontinuing the case against me ......... therefore, case to be 'Struck out'. The defendant asked what he could claim against DEL/CEL and the judge replied that he could not claim anything. He said that he had read the counter claim but that he should be pleased that its over. The defendant asked about expenses etc that he had listed, but the judge again said that he had no claim and that was it. "Go and enjoy Chelmsford." Same old same old. However, the March 18 case is more proof that DEAL, CEL and Creative are all linked companies. Discreet enquiries to the Royal Courts of Justice indicate that their Lordships will not be handing down the Judgment before Easter. The next term at the RCJ starts on April 14th, so it could be on that date, or at any time afterwards. This gives their Lordships time to scribble something down over the Easter break. Meanwhile ParkingEye continue to rely heavily on the original Beavis judgment, holding between 5-10 court hearings every day, while failing to inform judges that the judgment has even been appealed, let alone that the appeal has been held and judgment is pending. This is because judges who do not know the case is under appeal often follow the Beavis ruling and award cases to ParkingEye, while judges who know of the appeal are routinely staying cases. This contrasts with ParkingEye's behaviour at POPLA, where they have asked for cases to be stayed pending the Beavis ruling. In 2011 the number of parking cases filed in court was 90,000 (*BPA Estimate, bottom of page 9). The BPA informed the government that one on the benefits of the Protection of Freedoms Act 2012 schedule 4 was that it would cut the number of court cases filed. This freedom of information request shows that in 2014-15, the number of cases filed by BPA companies was over 34,000, and by IPC companies, over 3,000. The BPA can therefore be quietly pleased with themselves that they have cut the number of court cases by 2/3rds, saving the taxpayer a whole pile of money. Some explanation of the figures is needed - a twiddle stands for 1 to 5 cases. The MoJ does not specify the exact number in case this compromises any defendants. The Prankster is slightly intrigued by the cases filed by the University of Edinburgh Pole Dance Society. The clear leader is ParkingEye, who filed over 30,000 of the cases. As most motorists are bullied into settling before a hearing, this will have netted them around £1 to £1.5 million from the £50 solicitor fee they charge. As they do not actually incur this cost (claims are generated by computer), this therefore accounts for most of their £1.6 million operating profit, and is their single most profitable item contributing to their profits. Well, never mind. What's a tiny discrepancy of 89,000 cases between friends? The 2014-15 total does not include the 700 cases Proserve told a judge they filed, since they are not members of the BPA or IPC. Oh wait...it appears they only filed 12. Still, that's 3 more than last time. The Prankster wonders what this will mean in practice. POPLA have been telling motorists that their cases have been adjourned because ParkingEye requested this. In principle, The Prankster has no issue with cases being adjourned, but thinks POPLA should publish some ground rules. c) Who should be able to request delays? Parking companies? Motorists? Motoring organisations? POPLA themselves? The BPA? d) In cases where a criminal prosecution is ongoing, as with Civil Enforcement, should all their cases be stayed until the prosecution is complete? e) Does it have to be a parking case, or can cases be held up if there is a point of law at issue which is parking related? The Prankster looks forward to some answers. Going forward, it looks like this type of thing will be happening 2-3 times a year. However, The Prankster does have a serious concern that ParkingEye have not bothered to submit any evidence packs within the 28 day limit. it seems they want to have their cake and eat it. If they lose the appeal, they will not bother submitting evidence packs. If they win then they want the right to submit late packs. The Prankster consider this an abuse of process and that ParkingEye should have to abide by the same deadlines as everyone else. 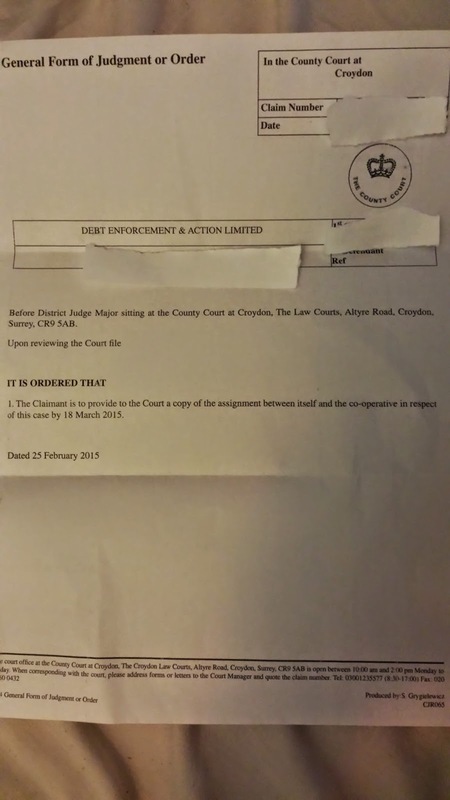 Debt Enforcement and Action Limited (DEAL) have filed another round of court claims, all signed off by the mysterious Mr Schwartz. Mr Schwartz has at last remembered how to spell his name. However, he is still struggling to come to terms with dates. The Prankster has received a number of claim forms for parking at the Co-op with the date of parking 1 January 1900. Horseless carriages had been around for around 15 years by then and so had the Co-op, but The Prankster does not think any parking problems existed, and Civil enforcement Limited certainly didn't. Other problems include stating the 'debt was assigned [...] with the knowledge of the Co-operative' when the Co-op have denied this, and that the claimant is claiming damages for trespass when they have no rights over the land. The claim is also for a debt which has only been partially assigned to DEAL and for which DEAL do not seem to have ever come up with proof of assignment. The claim also states the claim is for a contractual charge. The Prankster does not have copies of every co-op parking sign, and the fact that the true data of parking is not known does not help, but on the balance of probabilities this is not true either. Civil Enforcement Limited only moved over to a contractual model comparatively recently. The claim also asks for £50 solicitor costs. While this would be allowable if Mr Schwartz bills DEAL £50 for his time, the template nature and schoolboy errors suggest he is just given a stack of these to whip through and sign, and presumably charges accordingly. The Prankster suggests £5-£10 is the going rate for this kind of service. What to do if you had one of these? I enclose a claim form signed by Mr M Schwartz. I understand you are currently investigating him for various matters. I wish to draw the following to your attention, any or all of which may be breaches of the solicitors code of conduct. 1) The date of parking is stated as 1-1-1900 which is an impossibility and suggests he has not actually read the claim diligently or prepared it himself. I understand he has form for this type of behaviour, spelling his own name incorrectly many times. 2) He claims that the debt was assigned to the claimant with the full knowledge of the co-operative. However, the co-operative have denied this, and this therefore appears to be a fraudulent claim. 4) The claim is stated to be for a contractual charge. However, it is believed the signage at the time of the incident (which cannot be verified as the date is not given) in fact asks for damages for breach of contract and not a contractual charge. He is therefore either guilty of not correctly researching the claim or of improperly stating the claim. 5) The claim also asks for damages for trespass. As the landowner is the co-op, this is an impossibility, and Mr Schwartz must know this. 6) The form claims £50 for Mr Schwartz's costs. It is unlikely he actually charged this amount to the claimant, given the template nature of the form and schoolboy errors which no competent solicitor would make. If so this would be fraudulent on his part to sign the claim form stating he did charge £50. 7) The claim form was filed with no prior letter before claim. The last communication with this company was several months ago. This is a breach of the pre-court protocol. You must of course also defend the claim. The pepipoo website is a good place to go for help, and Gan has written a defence to see off this spurious claim. Don't forget also that the co-op has two test cases in the pipeline against CEL and DEAL for ticketing their own employees and refusing to cancel the tickets. A large number of motorists have received emails from POPLA telling them their assessments have been postponed from the next few days and will be heard late April to May. No reasons have been given for the delay. The Prankster has made enquiries of POPLA and found that this is to wait for the results of the Beavis judgment. The Prankster wonders whether it is in the remit of POPLA to delay assessments in this manner, and wonders where it should all end. Should Civil Enforcement cases be suspended until the criminal hearing is over? Should all cases be suspended, or just ParkingEye ones? Have ParkingEye put undue influence on POPLA to delay assessments? If so, this is especially cynical given they have denied the existence of the appeal to courts up and down the land for the last year. The Prankster wonders if ParkingEye have already made up their mind which way the verdict will go. Large number of appeals to ParkingEye which would normally have been accepted have been rejected. Finally, as ParkingEye have not even submitted any evidence for the cases in question, The Prankster considers it is outside the assessors remit to delay the case. 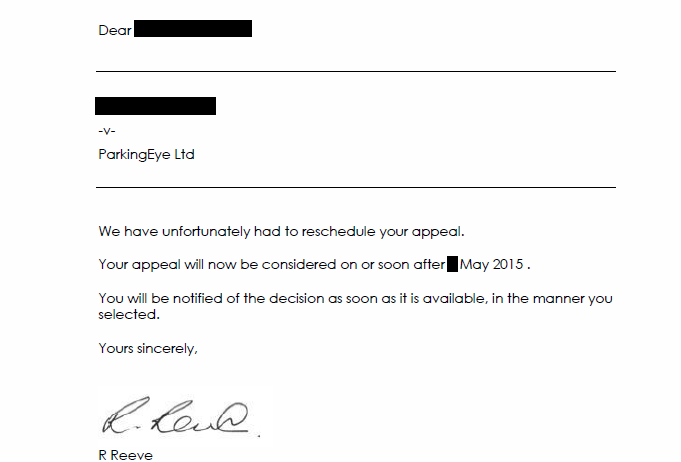 If ParkingEye cannot be bothered to reply on time, then the appeal should be automatically be upheld. POPLA's contract with the BPA requires them to only allow 28 days for evidence to be submitted. The Prankster has asked the Lead Adjudicator to comment and it is hoped something will be on the POPLA website later today. Today's post examines the signage at Liverpool John Lennon Airport, with grateful thanks to Esmerobbo who took photographs and made measurements. Vehicle Control Systems try and pretend that anyone who drives into the airport enters into a contract to pay them £100 if they stop on the airport roads. Here are the signs they use. The Prankster's first observation is that only the first sign contains the name of Vehicle Control Systems. As it is a general principle that you must know who you are contracting with it is the Prankster's view that only the top sign can form a contract. Apparently the top sign is only at the entrance to the Airport, so this is the only chance VCS have of forming a contract with the driver. A useful publication from the Department of Transport, 'Determination of x-height', describes how font sizes are calculated on road signs. The first observation is that drivers must be able to read signs without moving their head more than 10% from the road. This is for safety reasons. Both the Independent Parking Committee and the British Parking Association agree with this in their respective code of practices. S is the offset distance, defined as the distance from the centre of the driving lane to the centre of the sign. On dual carriageways this is measured from the centre of the right-hand-most lane. This gives C = 7.40 x 5.7 = 42.18m. The sign can therefore only safely be read from over 42m away. As the sign is placed 4.5m from a T-junction, it can never safely be read. The next consideration to examine is the number of words on the sign. 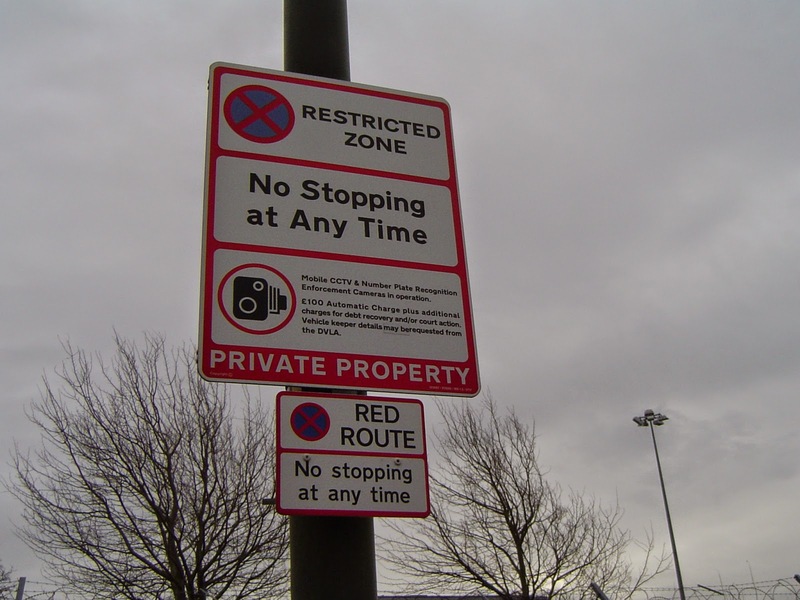 DfT guidelines state that a sign should contain no more than 6 words or directions. This is the number that can be scanned safely in 4 seconds. Any more than that and the driver's eyes are off the road for too long. Reading time R is given as 2 + N/3 seconds, where N is the number of words or directions on the sign. 2 seconds are given for the eyes to settle on the sign and start reading. The sign contains 66 words, not including the small print at the bottom. This will take 35 seconds to read.The only possible way to read the sign would be to stop at or just after the T-Junction, but this will be a breach of the alleged contract. 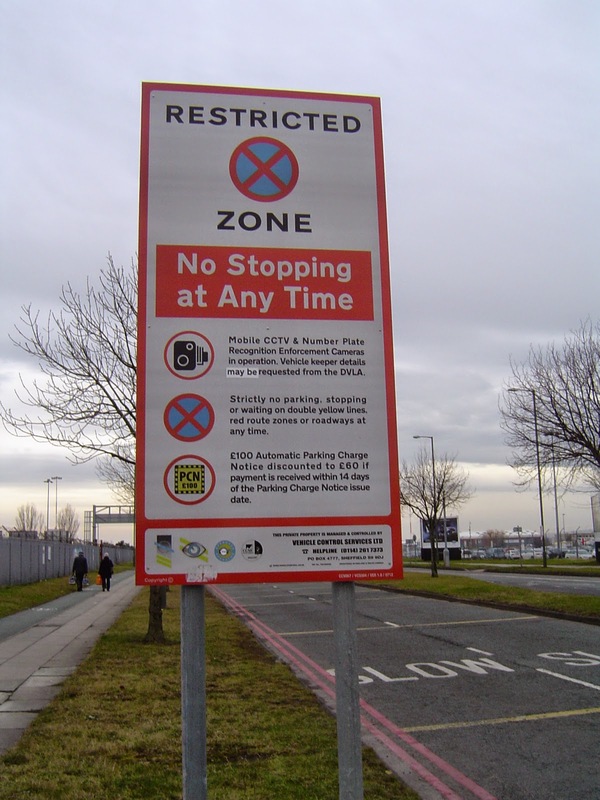 The first six words, and the ones in the biggest font, are 'RESTRICTED ZONE', No stopping at any...'. To form a contract there must be a meeting of minds. For this to take place, the driver must not only have time to read the sign, but also time to consider and digest the contract and decide whether to accept or not. In a car park, the driver can do this at their leisure; typically the operator will give 5 minutes for the driver to consider any contract and decide whether to accept or not. it is obvious that there can be no meeting of minds if the driver does not have time to read the sign, let alone have time to consider it, especially when their main focus must be on driving safely and not considering the intricacies of contract law. The final consideration is font size. The small print disclosing the £100 charge has capitals 4cm high and lowercase letters 3cm high. The eyesight standards for driving are here. They require a driver to read a 8cm number plate at a distance of 20m. This translates into being able to read 4cm letters at 10m, and 3cm letters at 7.5m. However, the sign is just past the junction, so generously assuming the speed is only 10mph this gives 1.6 seconds to read the sign. Sadly even this is not enough to read a single word. There also remains the impossible conundrum that the driver must stop reading the sign at a distance of 42m, but can only read the signs once they get 7.5m away. For the maximum 6 words at 40mph, we get R = 4 x 18 = 72m. The driver therefore starts reading the sign at 72+42m (114m) and stops reading at 42m. Each lowercase letter should therefore be 19cm high. The actual size of the biggest lowercase letter is 6cm. Therefore the font is less than 1/3 of the required size. In The Prankster's opinion, there is no possibility this sign can ever be said to form a contract with the driver, and the sign actually tempts drivers into unsafe driving practices, by making them turn their head too far from the road, and keeping their attention off the road for too long. Yet another DEAL claim has been struck out. This one was in Halifax and was struck out for failing to pay the hearing fee. This seems sensible on the part of DEAL - after all, if you have no intention of turning up to a hearing, why pay the fee? The defendant should now write to the court with a schedule of costs, charging their own time at the litigant in person rate of £18/hour. They should also download other judgments from the Prankster blog and send them in to the court to show this is a common occurrence on the part of DEAL and that they had no intention of ever going to a hearing. Mr A did his research and wrote to the judge expressing his concern that the case should be deferred due to the Beavis appeal. The judge informed the ParkingEye representative that they should have notified the court weeks ago about the impending appeal and as such the case will be heard after such time if applicable. He also stated that if Parkingeye lost that is the end of the case. If they win then negotiations should be adhered to with a payment offer that is sensible and in line with parking charges i.e. £20.00. The ParkingEye representative constantly argued that this case must be heard. The judge told her that even if he wasted 90 minutes of court time he would then defer the case until after the outcome of the appeal case (Beavis). The case was stayed until the Beavis appeal judgment. If you have received communications from ParkingEye which referred extensively to the Beavis case but did not mention it is under appeal, you could consider complaining to the solicitors regulatory Authority. The solicitors code of conduct is here. A solicitors first duty is to the court and they should provide all relevant information, even if it is to the detriment of their case. If you consider that mentioning Beavis without providing all relevant information is against the code of conduct, then the report form can be downloaded here. If you don't know the name of the solicitor involved, report Rachel Ledson, head of legal for ParkingEye. If Rosanna Breaks signed your claim form, report her. If you were the defendant in a hearing, where it was not admitted that Beavis was under appeal you should also report the LPC Law representative and LPC Law Head of Advocacy, Patrick Le Bas. Both Rachel Ledson and Patrick Le Bas were put on notice quite some time ago that it was their duty to inform the court that Beavis was under appeal. This form was signed on behalf of Civil Enforcement Limited. The Sethi Partnership later denied that Michael Schwartz was authorised to sign on their behalf. This form was one of the few hundred apparently signed during the period Mr Schwartz forgot how to spell his name. This was signed for DEAL. This is a recent form. Mr Schwartz has now remembered how to spell his name. In a shock move so many DEAL cases got struck out recently that The Parking Prankster ran out of joke headlines to use. The Prankster will now be forced to start churning out old headlines. The Prankster urges Gary and Ashley to get the owners to phoenix DEAL and start a new company with a different name. Meanwhile, if your case was stuck out, you should follow this poster on pepipoo and write to the court with a schedule of costs. hunter28 got £190 which is quite reasonable in the circumstances. The British Parking Association have also confirmed they are keeping an eye on the situation. If your case got struck out please send in the forms to publish to prankster@parking-prankster.com. It is reported that Aberdeen Trading Standards and the Solicitors Regulatory Authority are both keeping an eye on this blog so please also indicate if you are happy for your details to be passed on for these bodies to build their cases. The Scottish Express has published details about Civil Enforcement's excursion to the Scottish courts in Aberdeen yesterday. The case related to 11 counts including attempted fraud. The company allegedly attempted to deceive motorists by claiming they were liable for parking charges using laws which did not apply in Scotland. Some drivers have been aggressively pursued even though they declared they were not the drivers. Others were told they were liable under the Protection of Freedoms Act, Schedule 4, which does not apply in Scotland. It is not known whether CEL turned up. District Judge Major sitting at Croydon has produced the following General Form of Judgment or Order. l. The Claimant is to provide to the Court a copy of the assignment between itself and the co-operative in respect of this case by 18th march 2015. As the Co-op have denied any knowledge of such an assignment, this looks like yet another Order that DEAL will find it impossible to DEAL with. 5) Your own schedule of costs, costing your time at £18/hour. Costs are not usually awarded in small claims so you will be using the above to shw CL are acting unreasonably. CEL and Mr Schwartz's colourful history. The Solicitor's Regulatory Authority have apparently confirmed that CEL is the parent company of DEAL, which leads to the inevitable conclusion that passing parking charges to DEAL may be a way of artificially increasing costs. 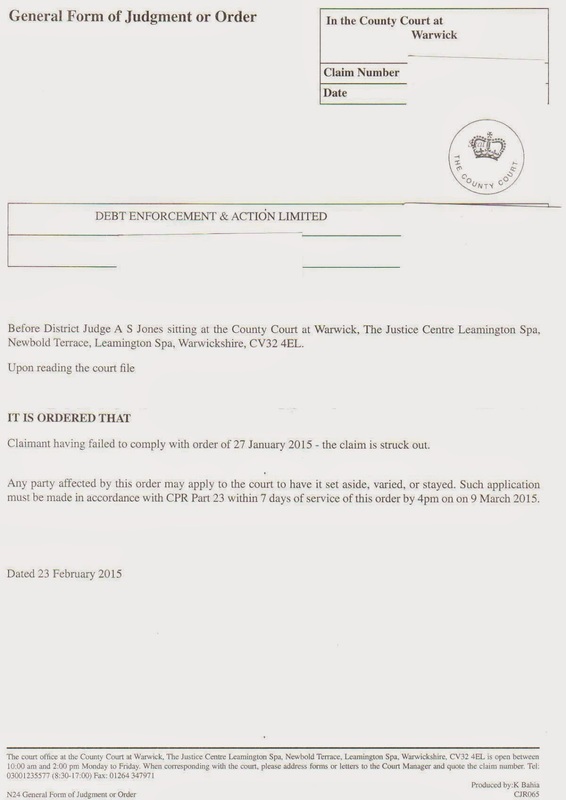 I can now confirm that I received a response from Civil Enforcement Ltd, the parent company of Debt Enforcement & Action Ltd, which confirmed that the solicitor in question is Michael SCHWARTZ, SRA id 118966. I can confirm that this person is a solicitor currently on the Roll of Solicitors of England & Wales and does hold a current Practising Certificate. 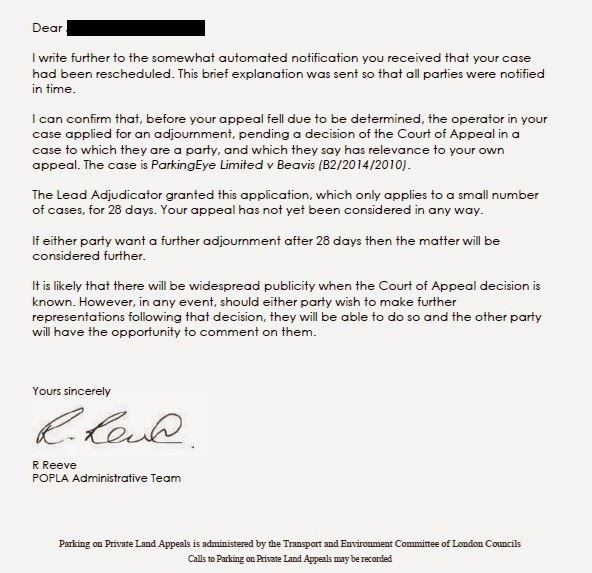 Furthermore Civil Enforcement Ltd has informed me that they have written to the Court informing them that there was a spelling error on the claims documents issued by referring to the solicitor as "SHWARTS"
Mr Shwartz has a colourful history, and pepipoo poster freddy1 did some telephone research. It appears a cheque somehow found itself in the wrong bank account. Pepipoo poster Gan has more information on Mr Schwartz. SnapperTV who produced the recent Dispatches programme told me that Sethi denied the association. A number of defendants who had received these amateurish claim forms wrote to Mr Schwartz and asked if he actually completed then, and if so, whether he really charged CEL £50 for them. They suspected someone might be impersonating them. Mr Schwartz refused to answer on the grounds of client confidentiality. 4 should Part 18 requests for information be sent to him or directly to his client ? 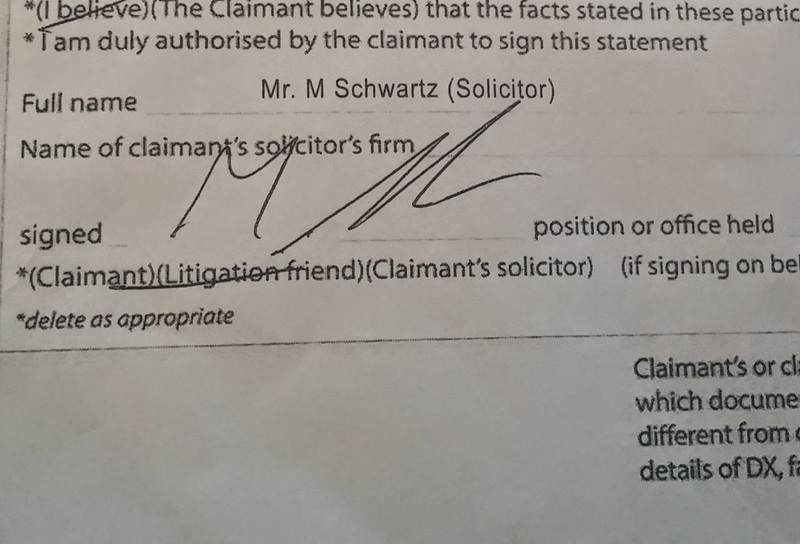 Especially if the contact was made "because the claim didn't appear to be written by someone that was legally qualified and the defendant was concerned that he had been impersonated"
The Prankster would like to investigate the possibility that Mr Schwartz allowed his signature to go onto CEL's claim forms in return for a small fee, say £10. CEL claims always state the solicitor fee is £50, allowing them to pocket say £40 extra. The Prankster does not know whether this is legal, but it certainly seems to be pushing the boundaries. The Prankster looks forward to an update after tomorrow's hearing. 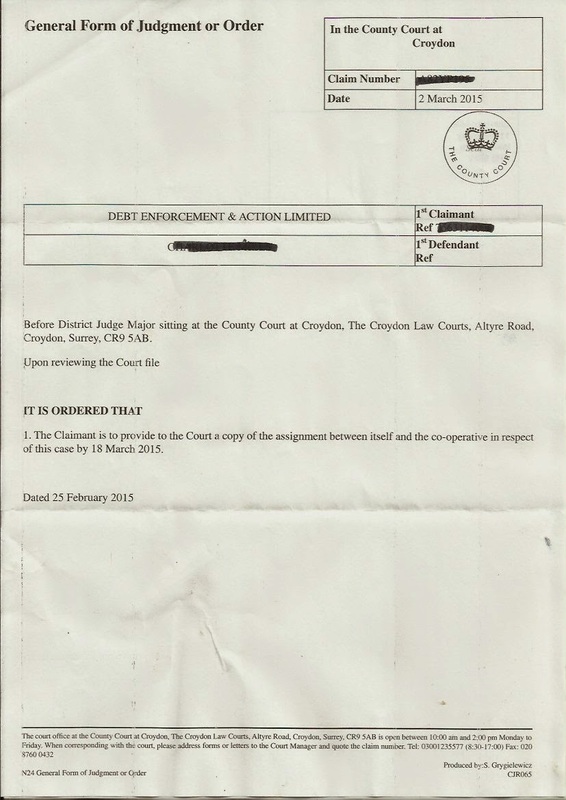 The Prankster has received this court report hot off the press from Eastbourne. I arrived at Eastbourne County Court nice and early. The clerk of court asked if I knew if the claimants were coming and I said it would be unlikely. [Prankster note. They are probably getting ready for their criminal hearing in Scotland on Wednesday] I went in at 2pm and the judge said he would continue with case management as I had an unusual argument he wanted to hear more about; namely that my membership of the Co-op had supremacy of contract over CEL's claims. I explained rather badly about mutual society and club law and he said that he wasn't sure and asked what else could I say to rebut their claim. I told him about the failure to respond to my CPR31.14 request for documents for sight of contract; proof of who was driving my vehicle as it wasn't me (this was a pre PoFA parking event); proof of Mr Shwarts acting on behalf of DEAL; and assignment of residue of supposed debt. He asked me if PoFA made a difference to my defence if it went to full hearing. I explained that protocols for keeper liability have a strict timetable and even if applicable CEL would have failed. I was asked about the fake solicitors signature and explained a little about the Creative/CEL/DEAL structure. He asked me if I knew about the Bristol case and I said that I did and that is why I thought that he might have stayed this hearing until after the end of the month when that would have decided certain things. I also told him that I had copies of the General Order of Judgment handed down from other courts and he asked me where I got my copies from. I told him that I got them from the Parking Prankster as redacted copies and he said they are available to the public in full if required. He then said that he had warned DEAL that if they didn't show up he would make a summary judgment so he did. Claim summarily dismissed with costs. My counterclaim is stayed for a year in case they want to ask for a continuance but he thought it unlikely - and if they did that the chances of him finding for them was nil and it would be unlikely that another judge would either so said that he didn't think it would be wise of them to argue. He didn't comment on the strength of my defence as he had no need to. DEAL have shot themselves in the foot again and it is clear that their reputation has gone before them. It is not entirely clear whether DEAL will be still in existence in a year's time. In order to justify their charges JAS Parking have come up with a new concept; the fictitious pre-estimate of loss. Unlike a genuine pre-estimate of loss, where you are required to make some kind of accurate estimate, in the fictitious pre-estimate of loss you can make up what figures you like as long as you retro-fit them to the required target figure. Here is an example of how it works. Here are JAS's pre-estimate of loss calculations for a POPLA appeal submitted circa July 2014. The POPLA appeal was lost because 'IT system install' costs were not an allowable head of loss. Here are JAS's new submissions circa January 2015. You see how easy it is if you use the Fictitious pre-estimate of loss method? Simply remove any item which the POPLA assessors previously complained about, and artificially increase the other heads of costs by random amounts until the desired total (in this case £94) is reached. Previously JAS parking have stated that it takes between 10-15 minutes for their attendants to issue a parking charge. This means their hourly wage at 15 minutes per ticket must be around 4 x £32.70 or £130.80. The Prankster expects a surge of applicants for the post of parking attendant at JAS parking tomorrow morning. 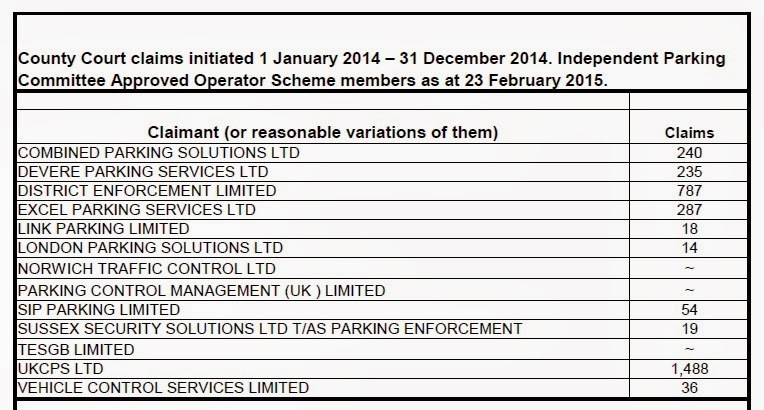 Previously JAS parking has stated it costs £3.50 to get DVLA details as they use a third party who adds £1 to the cost. The Prankster fails to see where the other £13.90 is incurred. 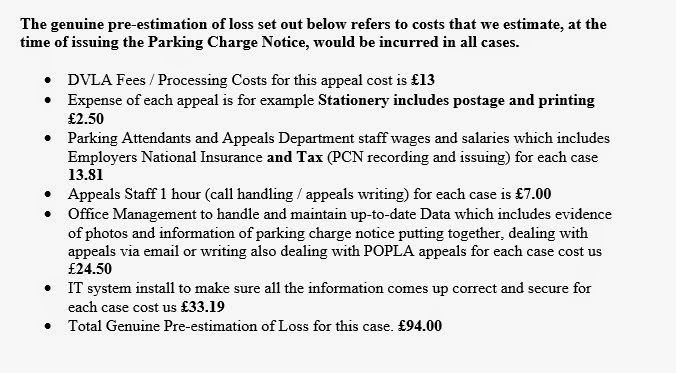 In the 2014 case JAS parking stated the cost of a POPLA appeal includes 2 hours of a senior manger's time and one hour of a director's time to check the appeal. The Prankster has seen their evidence pack and judging by the quality suspects that the 3 hours were spent playing tetris rather than checking the appeal. In any case, POPLA stated this was far too long to spend checking the appeal. In the 2015 case, JAS parking cannily removed the description while increasing the cost. The Prankster suggests that JAS leaves the BPA and joins the IPC. In the IPC appeals process operator evidence is not made available to the motorist, leaving the operator free to lie as much as they like without fear of awkward questions being raised by The Prankster.